Delicately crafted, this stylish 9ct gold 5mm diamond cut ring makes a perfect wedding band that any modern woman will treasure. 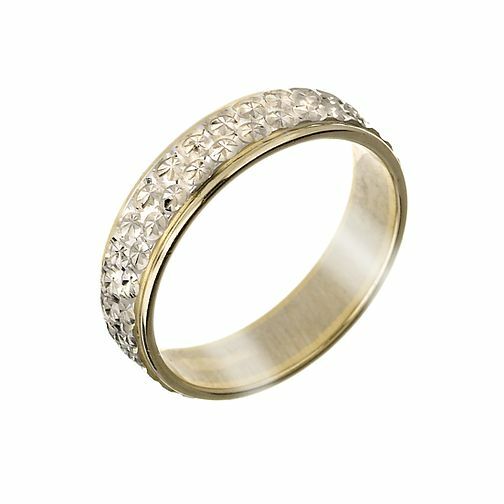 9ct Gold Two-Colour Diamond Cut Band is rated 4.3 out of 5 by 6. Rated 1 out of 5 by Anonymous from Fallen apart after 9 years If you want your wedding bands to last as long as your marriage then don't buy these! My husbands band is very thin (females one is much thicker) and his has split with general wear and tear. He works in an office so not daily manual work and the ring has started falling to bits. The gold outside part has split and come away from center light colour. Obviously we don't want new rings they are what we were married with. So so upset by this. Rated 5 out of 5 by Anonymous from Lovely This ring is so lovely you will not be disappointed.. I went into the shop to get it and only took 4 days for it to be ordered in.. Fab service at the Glasgow fort store..